Greg Buckman, a 1976 graduate of CAFNR, takes the reins of Missouri Cattlemen's Association in January. He raises Red Angus-Charolais cattle and hay at his Hallsville farm. Greg Buckman, B.S.E. 1976, just wanted to farm when he graduated from high school. College was far from his plans of riding John Deere tractors and working in the family dairy barn. “All I ever wanted to be was a farmer,” he says. University of Missouri President Mun Choi, fourth from right, was the first MU president to attend … Expand ▸University of Missouri President Mun Choi, fourth from right, was the first MU president to attend the Boone County Town & Country Dinner in its 57 years. Greg Buckman, 1976 CAFNR graduate, and his family were hosts for the 2017 event at Red Top Ranch in Hallsville. He also liked buying and restoring John Deere equipment and decided he wanted to work for Deere. However, he did not have the required college degree. That is when he decided to enroll in the University of Missouri’s College of Agriculture, Food and Natural Resources. He worked part-time at the John Deere dealership and also served as a bartender while earning a degree in agricultural education in three years. He was a member of the Ag Rho social fraternity, which he credits with many of his lifelong friendships and connections. He worked for Deere & Co. and MFA as a district sales manager for several years after college, but he missed farm life. He bought some land and began farming with a JD 70 tractor and a JD 8300 drill. He still owns both. The farm operation grew to 300 acres and 30 head of cow through the mid-1980s. That is when the U.S. farm economy tanked. Interest rates soared, exports dropped and farmland value plummeted. The JD dealership where Buckman worked closed. His farm creditors suggested he declare bankruptcy. The job gave him the flexibility to do farm chores, support his three sons in 4-H and FFA activities, and help rural people with their insurance needs while visiting around their kitchen tables. Insurance sales also helped him recover from the brink of bankruptcy. By 1987, he had bought land at the edge of Hallsville. He and the boys cleared the land of locust trees, junk cars and old wire. They built fences for rotational grazing. With the help of neighbors and members of the local Amish community, they built a house and red-roofed barns on what became Red Top Ranch. In 1988, he bought 250 more acres. He increased his cowherd. Over time, he bought more than 30 rental properties. He increased his acreage by renting and now has 26 landlords. 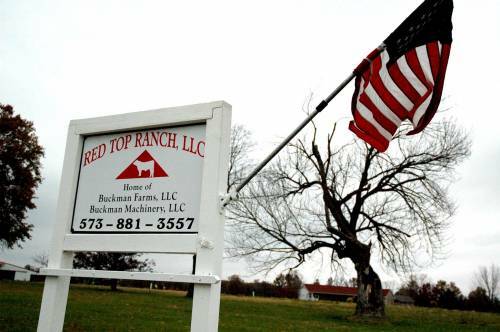 Red Top Ranch of Hallsville is home to Buckman’s hay, cattle and machinery operations. He diversified his operation with five established profit centers: the farm’s cattle, row crops and leased hunting ground; commercial hay; rental properties; machinery; and insurance sales. He sells about 15 to 20 refurbished pieces of farm equipment yearly. He bales 20,000 square bales and 1,000 big round bales each year. About 90 percent of the square hay bales go to farmers and ranchers in Missouri and Florida and to area horse stables. His first love continues to be cattle. He breeds Red Angus cows with a Charolais bull. The “mellow yellow” offspring “grow like a weed” and turn quick profits, he says. He backgrounds cattle and follows a strict red tag practice. He uses rotational grazing, moving cows to fresh paddocks every two days. Calving splits between spring and fall. Red Top Ranch is a hub for agricultural education and fun. For the past seven years, Buckman and the Boone County Cattlemen’s Association offered Beef Camp Day for 250 third- and fourth-grade students. For 31 years, hundreds of friends, family and customers attended the October bonfire, hayride and pig roast. 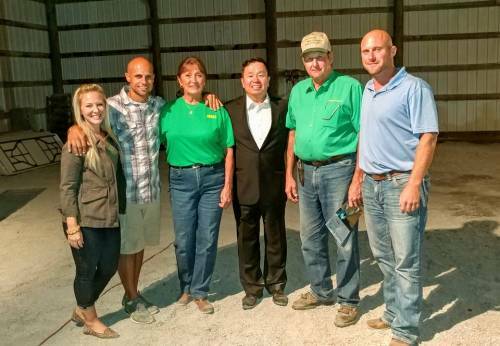 This year, Buckman and his sons hosted the annual Boone County Town and Country Dinner. UM President Mun Choi was the first University of Missouri System president to attend the event in its 57 years. Buckman says he is encouraged by Choi’s understanding of the importance of agriculture to the university and the state. Buckman takes the reins of the Missouri Cattlemen’s Association in January. He joined when he was 22, broke records for member recruitment and helped set up new county affiliates. His work earned him recognition as Missouri Cattleman of the Year in 2015.